But gradually, under the influence of the upper Light, in our consciousness, the recognition of what is happening changes in us. Only after several years does a person begin to understand that the implementation of the method is fulfilled only in his connection with others, that the spiritual world isn’t somewhere over the ocean, or somewhere else, but that it is here. You just have to change yourself and your internal perception—now you want everything for yourself, but you have to reach the opposite state, to exit yourself, and instead of inward, aim outward. The recognition that everything depends on your internal attitude towards the world is a very meaningful change over. It really takes the Light a long time to influence us. Every lesson, every addition, is another tiny portion of the Surrounding Light that influences us from a distance bringing us closer. There are great changes taking place all the time. But there are so many that it takes several years. In the past it took many years, let’s say 20 years. Today it can be limited to several years. It may very well be that when the masses reach it, even by just a little, by yearning and making efforts in this direction, it will take less time. Still it is a changeover in consciousness, in our recognition, since you don’t think in terms of time and distance any more as if the upper world is somewhere far away. You already understand that it is here, and it is simply your attitude towards it and the way you think that create it. We talk a lot about the things we want to achieve, attain, and reveal. But we have merited this aspiration because the entire world needs it. How can we help the world? Everything around us is filled with the upper Light that permeates us, but we don’t feel it yet because of our egoism; great abundance exists in the world. There is everything! Only our egoism does not allow us to share with others, expand it in a way that would make everyone happy. Thus in the end everyone suffers. Let us think about what we can offer to the world, how we imagine a corrected society where everything already operates according to the laws of mutual bestowal, love, and participation, when everyone understands that they are connected into one common system, and it cannot be that some are happy and others are not. This interconnection manifests between us to such extent that we automatically behave this way. We reveal that we are an integral system. We only think about reciprocity. A person who thinks about others no longer needs anything else. As Baal HaSulam writes, everyone thinks about everyone else. I am certain that my friends are thinking about me, and this is why I cannot even think about myself. And this forces me to think about others. The Creator pushes us towards this kind of unity, this kind of society. We hope to come to this is in a good way—through dissemination, education, and upbringing instead of having suffering, blows, and different cataclysms and catastrophes push us towards it. Let us use the simplest example, a small town with a population of 50 thousand people: Ten thousand are working at the largest enterprise in the city. Right now they only spend half a workday working; there is no work. Ten thousand people are elderly and retired. Ten thousand are children. And another twenty thousand people are in the service field, they work in all the city’s systems. The problem is that the big factory, where ten thousand workers, engineers, and other professionals work, is closing. And for this reason the main source of income in the city is being reduced twofold since the revenue brought to the city by the factory circulates in all the fields of service. This is a common problem, which today appears in many places in the world. And now imagine, what we can offer to the population if we were to introduce our system of integral upbringing and education. For example, we can begin with the employees of the plant since half of their workday is becoming free. How can we come to the other people in the city: the homemakers, children, the elderly, and those who are employed in municipal services since their workload, together with their salaries, are also naturally being diminished? What kind of changes would happen in the city if we were to gradually introduce new social relations between people, spouses, within families, the household, on the street, the parks, in service, cleaning, delivery, in all the city and municipal jobs? How can people who create integral relations save and cut their spending in a way that they are not able to feel it? Can this be done? How can the double drop in the main city revenue be compensated in a way that a person practically does not feel it when he offsets it with new social relations, relationships between people? Imagine how a town like this needs to live. We must bring all of this in order, we must discuss and gradually incorporate all these problems into a system, and solve them because this really is a problem. And today it is already arising in many places. If we are able to express this in a realistic way and imagine it together with scientists, sociologists, and political scientists with calculations and numbers, this will bring us closer to realizing these ideas. But naturally, in general, nothing can be solved without integral upbringing. And this is the main thing. Moreover, we must not forget that no problem can be solved without the influence of the Surrounding Light. We must still take into consideration that no matter what our undertakings are like, no matter what kind of wonderful ideas that great people and great minds propose – nothing will work without us hoping, knowing, and working in a way that will attract the Light, and then it will do it. Question: What is the spreading of the attributes of Bina downward, which helps the lower one? Egoistic forces retreat before the Light of Hassadim (Mercy); they are afraid of the mother. After all, she shines with the Light of bestowal that is totally opposite to them, and they cannot understand it and be next to it. Try to stop a person on the street and tell him that he must love others. Can you imagine the negative response you would encounter because this is a most hateful and repulsive thing for a person? Thus, Bina protects us. Can you see how the spiritual world guards itself from us, the egoists? If you really want spirituality, please, come and bestow! But if you want to receive spirituality, these two things don’t go together. Spirituality is bestowal. So, until we are ready, it protects itself from us with a shield. We cannot even get near the spiritual world because it repels us like the two poles on a magnet. Why should I get near something like that if there is no benefit in it, only losses? How can I get close to something that means death for my ego? So, by spreading in the lower Partzuf, the mother (Ima) covers all its vessels, thus ensuring that they will remain in holiness. The intention of “in order to receive” cannot be evoked in such a place when the mother protects us this way. Then, the mother’s beauty is revealed, Hochma, and it becomes attractive, like a woman, a bride, a sister. However, this is when Hochma is revealed within Bina. Bina, itself, isn’t attractive; it only provides protection. “Not to mention that the possibility of renewed crisis in Europe and a hard landing in China—compounded by a decline in demand for Chinese products from Europe—continue to hang heavy on prospects for the global economy. My Comment: By the way, the crisis didn’t disappear anywhere, all of its ups and downs are the temporary hiding and manipulation of records; it’s no more than a temporary reviving of the dying—the world economy of network marketing, which will collapse without constant expansion! Question: Considering the fact that everyone lives in different time zones and everyone has different time constraints, is there a possibility for a certain platform to exist one day, where there will always be a seminar going on so people could connect to it when it is convenient for them? Or does a seminar need to begin and end within a certain framework? Answer: I think that all this can be saved on some kind of a storage medium, and people can enter through the Internet and study in any form convenient to them: alone or as a group. Of course it is best to study as a group. It is best to study when you are free from any disturbances, etc. But in general, it does not matter. You are gradually entering a virtual force, which you are not yet able to perceive. This work is psychological. Baal HaSulam writes that this is the continuation of materialistic psychology, but this psychology is of our next level of development, which works with desires and intentions, the things that our corporeal psychology also works with. There is nothing mysterious or mystical about this. We must develop these qualities in us! And nothing else. There are many people in the world, for example the Bedouins in Israel, who can feel nature very well and are able to tell what is happening 50-100 kilometers from them by reading the tiniest signs; they do not even know how they do it. They feel the Earth, or can tell what is happening in the world according to the behavior of an animal. We once possessed these feelings too. But they have simply disappeared in us since we have stopped using them. And now we are developing new senses. When you start attending a music school, you gradually develop pitch, musical memory, etc. If you do not develop these things, you remain an amateur. You can develop anything. Basically, this rudimentary organ exists in us. We simply must develop it. And Kabbalah tells us how to develop the perception of the upper force. We were developing normally in our world, while we did not need it. But now we have reached a state when we do not see a solution without it. We must reveal it. Imagine when the entire program of nature, all the knowledge, all the qualities, everything passes through you, and you see and feel all of this—then what kind of problems or crises could there be?! Instead of seeing all this as disturbances, you see it as help, birthing contractions, which help you to be born. You are being pushed to the next level. This is what I see in the world instead of a crisis. And once the people see it, they will go forward with joy and gratitude! 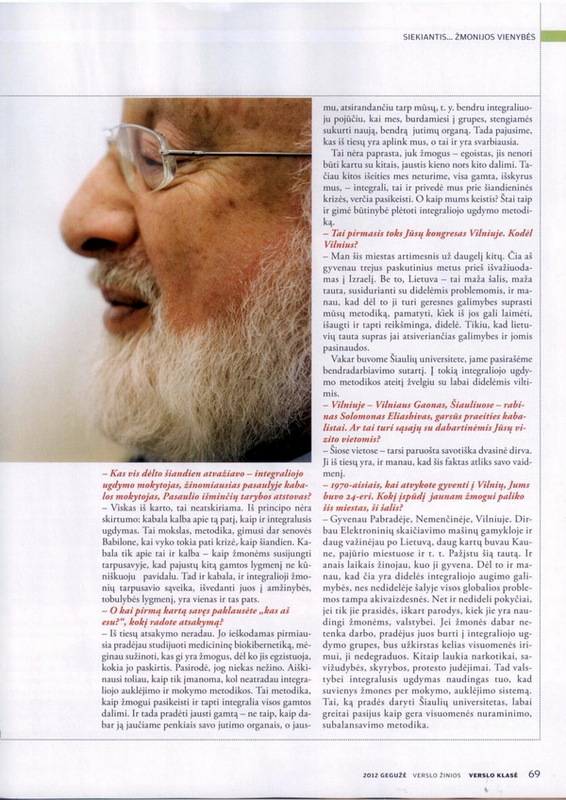 The Lithuanian magazine Business Class published the interview which I gave to the magazine’s correspondent before the beginning of the European convention in Vilnius. The magazine is intended for business people and comes out once a month as a supplement to the newspaper Business News; the magazine’s circulation is 22,000 copies. Question: At the workshop, I felt the interaction between the masculine and feminine parts. This was an absolutely extraordinary feeling! Now an intensification needs to occur that is amplified not tenfold, but a hundredfold. From where do I obtain this addition, this intensification? What needs to be done, and by whom, right now or at the next workshop? Answer: A workshop shouldn’t end. A workshop is a small, intermediate stepping stone to the next degree. We shouldn’t forget this state, but keep it within us. If we go outside or sit down to a meal, we maintain the same state as now. The meal should proceed calmly. Don’t disturb a person sitting next to you with some extraneous questions. There should be minimum discussion. I’m not saying that you should withdraw into yourself, by no means. But every person should feel that they have time for thoughts and feelings. And the most important thing is to preserve what we felt right now. This is the state that we need to come to. And after a meal, try to preserve this state even more, because any disturbances that are here and there need to be connected toward the strengthening of our present feeling. Everything needs to pass smoothly from one into another. Practically the whole congress is one single action. In principle, this should all be accompanied by steady movement with constant ascent. I am asking you not to lose what you are receiving, collect it bit by bit, the way a child accumulates knowledge and skills and becomes big. This is why all the disturbances should immediately be attached to the movement forward. You will see how fruitful they are. It is thanks to them that we advance. It is written that egoism is “help against you.” It is against, but it is indeed help. Answer: No. We have to move forward through Kabbalistic sources. We need to read articles, analyze them, and precisely through these articles to penetrate the world of the Creator more greatly and deeply. We can reveal Him only if there is a primary Kabbalistic source in front of you. Under no circumstances should you trust your thoughts and desires! It’s necessary to follow the text. If you don’t like one text, take another; you can change them. I open a book, say, Shamati, on any page and I begin to do spiritual work from it. If I see that the page I opened isn’t right and doesn’t quite correspond to my state, then I can turn another 15-20 pages—that’s not important. Then I start reading and working here. But nevertheless, I work from whatever is written in the book. After all, a Kabbalist describes sequential actions of cause and effect that incrementally lead you forward. And if you’re going to make things up yourself based on that mass of thoughts and feelings that rise up inside you, then who knows where it will lead you. Being small, we learn like this from older kids, and they tell us what to do, how, and why. And so we must keep on studying like this, progressively. When starting a workshop, we need to concentrate on and think only about what unites us—our points in the heart. We need to unify them. Then each of us and the group as a whole will have many times more strength. Most importantly, this force will be directed at connection with the friends, and then it would be able to evoke the upper Light, which will begin to manifest in this connection. We need to feel that in the connection between us, the common Light is revealed.